3 Beds 2 Baths 871 Sq. ft. Description: Location, location, location! Investors or first time buyers you have to see this one! Home has any renovations including, newer shingles, upgraded electrical, plumbing throughout, remodelled bathrooms have ceramic tile walls and flooring, newer cabinets, sinks & toilets. Original hardwood in living room, hallway and bedrooms. Newer furnace and hot water tank, eavestroughs and downspouts. Large eat in kitchen with oak cabinets, ceramic tile floors. Basement living area boasts 2nd kitchen, private entrance, has sub floor for warmth, large newer windows, newer carpet & more. Fenced yard with rv parking with plug in. Single garage & there is room to build a double. 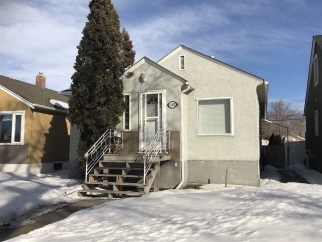 Close to royal alex hospital, downtown, nait and kingsway mall.